BEST TIGER 3lbs to Mr? SPORT: There are loads of big fish coming out of Bank House at the momen. David McCabe took three lovely trout on a Dawson’s Olive in a half day session. David fished the lodge pool on a floating and intermediate line to tempt an 11lb 8oz rainbow a 6lb brownie and a 2lb blue trout. He just needed the elusive tiger trout to complete the Bank House McNab. The best catch went to Mr A Wilkinson who took 16 trout from all over the lake on a white apps worm. His catch included a 13lb rainbow trout and the angler next to him lost one a similar size at the same time. A hothead damsel caught well for Robin Bamford, he too landed a cracking rainbow that tipped the scales to 10lbs 8oz and Michael Porter had a 9lb 8oz rainbow and a 4lb+ brownie, which also fell to damsel patterns. I was out fishing on Christmas Eve with Vince Williams and we found static buzzers were working well. We weren’t using a bung just long lining them and keeping the line tight, you know one cast every 5 minutes. We had plenty of takes and found that olive or lime green patterns were favoured. 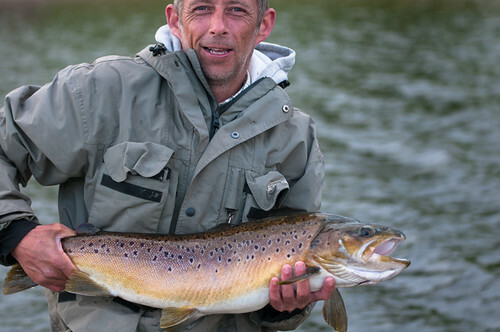 David McCabe went on to catch this lovely brownie and a nice blue trout. Robin Bamford caught this 10lb 8oz Rainbow on a Hot head Damsel whilst fishing from Witches Island. The fish put up a very lively fight that really tested his 5 weight rod! This entry was posted in Stocks Reservoir Fishing Reports on December 26, 2012 by Ben Dobson. The match due to be held on Saturday at Bank House has been cancelled. So we are open to all anglers and it is business as usual. We are fishing really well a full report will follow shortly. Ps All the fly tying materials have been brought down from Stocks to the Bank House shop. There is also loads of bargains available at the moment just ask. If I have it in stock i can give you a great price. This entry was posted in Stocks Reservoir Fishing Reports on December 6, 2012 by Ben Dobson. At Bank House this coming Saturday December 8th. We still have places available. Please call me on 0789 6000 939 to enter. This popular competition is now in its fifth winter series. This year there heats both north and south of the border. Last year there were heats and a final that raised a total of £1,200. In the final that meant they paid out £15.50 for every fish caught. This year they are hoping to raise £2,500. Please remember that this is fun comp with a bit of an incentive. Entry is £10 per heat plus the fishing fees and you can enter as many times as you like. Entry fees will go into the pot for the final. Please note the grand final is on February 23rd 2013, which is the same day as the opening day on Stocks Reservoir. The fishing is catch and release. All heats start at 9am with a briefing 8:45am. All hooks must be barbless or de-barbed and you can have up to 3 rods set up. This is a pegged match moving every 40 minutes and there is a break for lunch. If you would like to enter please call me on my mobile or reply to this email with your contact details. You’ve got to be in it to win it! This entry was posted in Bank House Fishing Reports on December 3, 2012 by Ben Dobson. Well another season draws to a close. I would like to say a big thank you all the anglers that have visited us this season, we really value all your support. It has definitely been a season of two halves. We got off to a cracking start: the fishing was great and we saw some cracking specimen fish caught, but then the rain came like we’ve never seen before. The wettest summer since records began caused an unprecedented amount of land erosion on the catchment above Stocks and the water became extremely coloured with suspended solids. It killed the fishing and the reservoir didn’t get a chance to recover. Every time it started to clear another downfall would cause the reservoir to colour up again. It has been only very recently that the water clarity has returned to normal and the last of the sediment seems to have been washed away. As a fishery owner it was heart breaking to witness. Charlotte and I would like to thank you so much for your continued support and for all your kind words of encouragement. On a positive note the water coming into the reservoir is now really clean and so we are looking forward to a great 2013 season. The growing conditions for the trout in the farm have been fantastic so expect some really big fish next year. Stocks is going to come back with a bang! Watch this space. I will post a full month by month review of the 2012 season over the next few days, but I can tell you that The Doubles Club fish off was won by John Read with a rainbow of 2lbs 11oz. Well done John you have a season ticket for 2013. Hopefully we will see you over the winter at Bank House Fly Fishery, remember we circulate the water at Bank House so we don’t freeze over like other waters and can keep the fishing going unless the weather gets really extreme. The fishery is fishing really well, there are some really big blues, rainbows and browns in at the moment and tigers to about 6lbs. If we don’t see you, have a wonderful Christmas. This entry was posted in Stocks Reservoir Fishing Reports on December 1, 2012 by Ben Dobson.